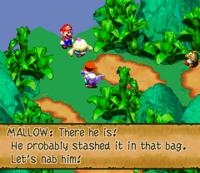 Mallow is a Nimbus from Super Mario RPG: Legend of the Seven Stars. He is the biological son of Queen Nimbus and King Nimbus and the adoptive grandson of Frogfucius. He is also the de jure prince of Nimbus Land, as well as Mario's first partner in the game. In battle, Mallow isn't especially strong physically; however, he has a strong command of magic, including the ability to heal. All of his special attacks are weather-based. Mallow was born to the royal family in Nimbus Land, King and Queen Nimbus. However, while still an infant, Mallow was lost. He was eventually discovered near Tadpole Pond, by the sage Frogfucius. Frogfucius removed the basket from the waters, discovering a little ball of puff inside. On the cloud child's belt, the name "Mallow" was inscribed. Frogfucius rightly deduced that this was the young cloud person's name, and he decided to raise Mallow as his grandson. The old frog raised him as one of his own, and as such Mallow grew up believing he was a tadpole, despite his unusual appearance in relation to the tadpoles he grew up with. However, throughout his childhood, Mallow never felt like a normal tadpole - he didn't have a tail, he was a bad jumper and a terrible swimmer; additionally, he was also much larger than all the other tadpoles. One day, Mallow visited the Mushroom Kingdom to buy a Cricket Pie for Frogfucius. However, the Frog Coin he was given to buy it was stolen by Croco, a reptilian thief. Mallow attempted to chase him, but Croco was too fast. Mallow gave up and began to cry. A rainstorm started, revealing Mallow's unusual control over the weather. Mario witnessed this and assisted Mallow. The two of them traveled to Bandit's Way to catch Croco. After chasing him, the two caught Croco and regained Mallow's coin after a battle. Mallow thanked Mario and they returned to the Mushroom Kingdom. The two of them rescued the Mushroom Kingdom from the monsters it had been overrun with: Shysters and Mack, one of the members of the Smithy Gang, recovering a Star Piece in the process. The Chancellor thanked Mario and Mallow, but revealed that he was worried about Smithy and his weapons. Mallow suggested that he and Mario go to Tadpole Pond to visit his grandfather, Frogfucius, who might know what to do. When they arrived, Frogfucius told the two that they need to collect seven Star Pieces. Additionally, he revealed a secret he had been hiding: Mallow is not really a tadpole. Mallow was shocked by the news, but Frogfucius told him that his real parents were out there, somewhere, and that he would be joining Mario to help him and to find his real family. Mallow, who had been expecting to stay at Tadpole Pond, nevertheless agreed, and he accompanied Mario on his adventure. After traveling with Mario for a while, the team went to Nimbus Land, a city on a cloud inhabited by people who looked remarkably like Mallow. When they arrived, they noticed a commotion at the castle. Valentina was telling a group of citizens that she had found "Prince Mallow" after all the time he had been missing. She brought out Dodo, a large bird. Everyone believed that Dodo was indeed their missing prince. Mallow himself mentioned that it was interesting that there was a prince with the same name as him, not suspecting anything. He also suggested to Mario to pass by the area, citing that it was unimportant to the star search. While in Nimbus Land, they visited Garro, a sculptor. There was a golden sculpture at the side of his room. Mallow noticed it and remarked that it looked identical to him. Garro said that it was the king of Nimbus Land when he was very young; then he turned around. He realized that Mallow was indeed the missing prince and that Dodo was an impostor, and sent them to the castle to stop Valentina. Mallow then found out that he was one of the Nimbus People and indeed their prince; he also finally managed to meet his true parents, King Nimbus and Queen Nimbus. Despite his opportunity to return to the throne and take care of princely matters, Mallow decided to continue traveling with Mario until their quest was over. Mallow was last seen in the first of the many cutscenes generated by the Star Pieces spangling the Star Road during the game's ending sequence. He was here shown presenting himself to his people; the facts that he was dressed in a crown and cape indicate that he had by then taken up the role of prince once and for all. Mallow appears as a spirit in Super Smash Bros. Ultimate. Mallow is a Nimbus with an off-yellow coloration on his body, pink shoes, and pants which are blue and white striped. He has a pink stir of hair, beady eyes, and a brown belt with a light-blue buckle. Before joining Mario, Mallow suffered from low self esteem and was a bit of a crybaby at times, however as they journeyed together, he built up his courage and proved himself to be a levelheaded member of the party on numerous occasions (such as when he held Mario back from unwisely attacking Bowyer). Mallow becomes very emotional multiple times in the game: namely, when he fails to apprehend Croco and return Frogfucius' coin, when he finds out he is not a Tadpole and Frogfucius is not his real grandfather, when he finds his real parents' wish for him to come on on Star Hill, and when he finally meets his parents. Mallow looks up to Mario as a role-model and admires his jumping skills, much like the other tadpoles do, which was how Mallow was raised. Even Mallow's own father, King Nimbus, enjoys the sight of Mario's jumping abilities. Mallow is a spellcaster, granting him high stats in magic, but not in physical abilities. Mallow's HP count the lowest, but his magic stats are among the best in the game, being similar to Princess Peach. Mallow's defense on both sides is above average, though, temporarily surpassing Mario's before Bowser joins the party. Mallow's offensive spells all hit groups, except for Shocker, making him useful for dispatching crowds. Mallow has healing abilities that can be useful when Princess Toadstool isn't available. Despite his melee shortcomings, Mallow's ultimate weapon, the Sonic Cymbals, is the third-strongest in the game. In addition, Prince Pants, his ultimate armor, is tied with Hero Shirt and Royal Dress as the strongest, not counting Work Pants, Super Suit and Lazy Shell, since they can be equipped by anyone. Description: Attacks all enemies with lightning magic. Hit "Y" just before the attack ends to do more damage. When Mallow uses a Special Move, a green club is superimposed over his body. In many of Mallow's cut scenes, and every time he uses a special move, his body detaches from his pants. Mallow's name is derived from "marshmallow", the consistency of which are associated with clouds. This page was last edited on February 8, 2019, at 21:15.